CHICAGO - The Twins put infielder Taylor Motter on the seven-day concussion disabled list and are bringing up catcher Willians Astudillo from Class AAA Rochester for today's game against the Cubs. Motter suffered a bruised sternum on Thursday when he crashed into the outfield fence while chasing after a ball Thursday against the White Sox. But he experienced concussion-like symptoms afterward. Motter is 0-for-14 since being called up by the Twins a couple of weeks ago. To make room on the 40-man, the Twins designated pitcher Felix Jorge for assignment. As for Astudillo, I can't wait to see him hit. He's batting .290 in 49 games for Rochester, where he has caught and played at first, third and the outfield. His goal is simple: To hit his way on. He has FIVE walks and NINE strikeouts in 188 plate appearances. In 609 games and 2,342 plate appearances over nine minor league seasons, Astudillo has walked 80 times while striking out 76. Miguel Sano has struck out 66 times THIS YEAR. The 26-year-old Astudillo, who is 5-9 and listed at 225 pounds, has never played in the majors. He was in major league spring training camp this year, although he reported late because of visa issues. He'll wear No. 64. Anyway, I have arrived at the Friendly Confines of Wrigley Field, and I really wish I could wear shorts today. It won't be at hot as the Twin Cities, where temps are racing toward 100. But it's going to be 96 here. Currently, it is 89, but the dew point has it feeling like 94. 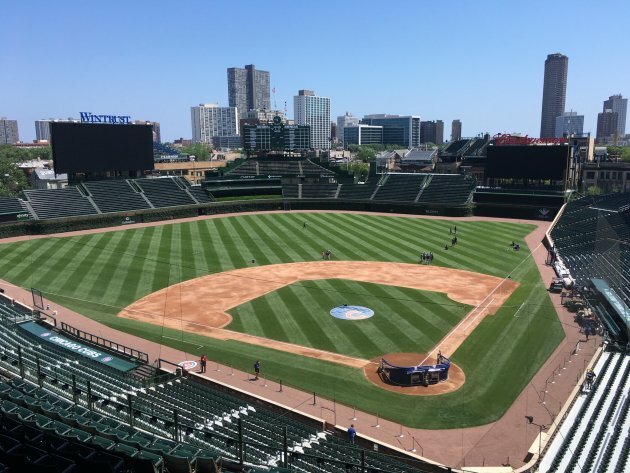 The press box at Wrigley has no air conditioning. In fact, I can honestly say that I haven't been here in nine years, and the $575 million to renovate this place must have be allocated to every area BUT the press box!!! Can't wait to see how many Twins fans are in town this weekend. I already have run into many of them around town. In fact, there might have been more Twins fans than White Sox fans by the end of yesterday's thrilling 2-1 victory in 13 innings. I'm kidding about it being thrilling. There were two bases loaded walks, for goodness sakes! The last time we all were here, a sick Joe Mauer homered in the first game despite the flu and Jason Kubel hit one that landed on Sheffield. And my pal Julian of Ballpark Tours reminded me of the June 12, 2009 game in which Milton Bradley, who was already in the middle of a miserable day, caught Mauer's sacrifice fly with runners on first and third, and flipped the ball into the stands. The problem was that there was one out. Nick Punto tagged and scored from third. Brendan Harris was awarded third base. Bradley was mercilessly booed by Cubs fans and laughed at by Twins fans. What memories will this weekend series provide us? Byron Buxton went 2-for-7 in a doubleheader on Thursday, but that's burying the lead. Buxton actually was thrown out trying to steal in the first game. Jorge Polanco went 4-for-7 in the two games, including a triple. Both are expected to play again tonight. 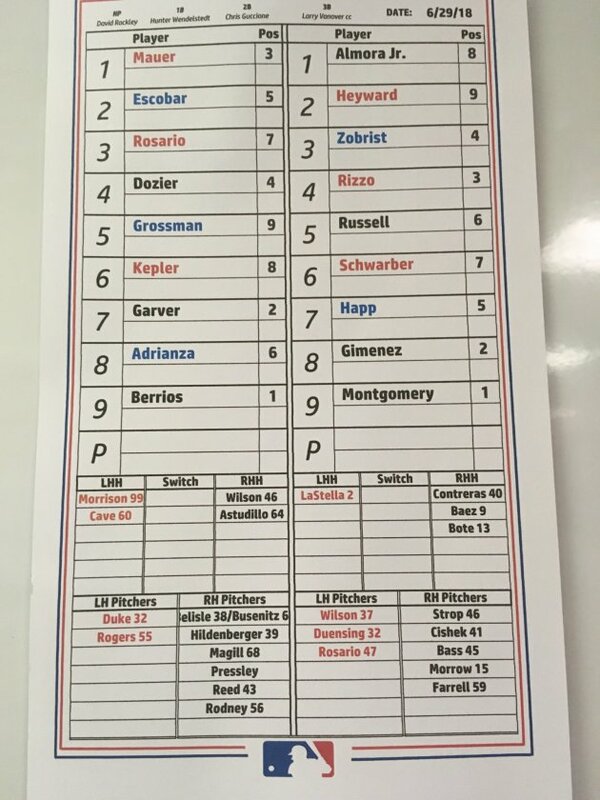 Here are today's lineups, with Mauer leading off and Jose Berrios on the mound for the Twins.